We hope you are as excited about this new collection as we are. We have had a lot of requests for a new Angel and this is one of Deb's favorites. She is a darling little Angel that has been sent here from heaven. 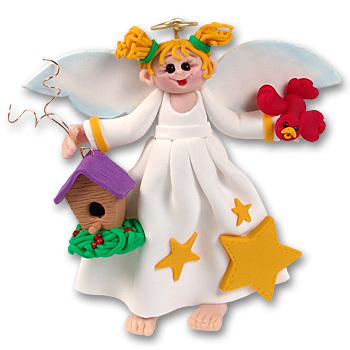 This Angelina Angel has blond hair and is feeding her little red bird friends. She may be easily personalized on her star. If your little Angel has blond hair than this is a must as a special personalized gift. Handmade from polymer clay and designed by Debi Allison. She comes complete with a hook and satin ribbon for hanging. Stay tuned for the rest of the story.